The Nativity according to the Flesh of Our Lord, God and Saviour Jesus Christ. Sviatki. Fast-free-till the Theophany Eve! The Adoration of the Magi: Melchior, Caspar, and Balthasar. Commemoration of the shepherds in Bethlehem who were watching their flocks and came to see the Lord. Христос Pаждается! Славите! Christus Natus est! Gaudete! Χριστὸς Γεννᾶται! Δοξάσατε! Hristos se Naste! Ma ç riòi-L! 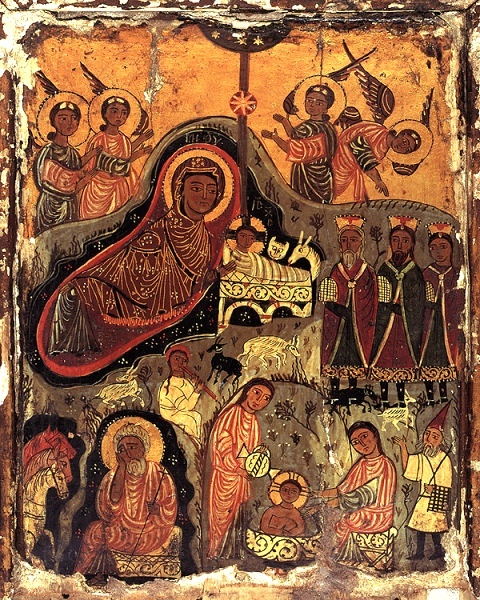 Encaustic Nativity icon c.7-9th century. St Catherine’s Monastery, Sinai, Egypt. Make glad, O you righteous! Some Lovely Carols can be heard on the American Carpatho Russian Website. And here are some Monks from Optina in Russia! Enjoy!!! And a Blessed Feast to All! Christ is Born! Go tell it on the mountain! Jesus Christ is Born! 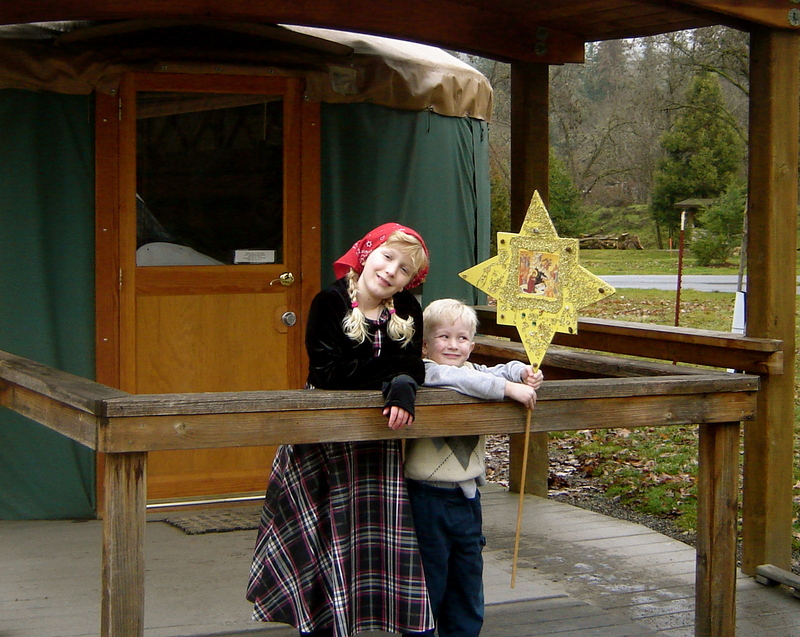 Nativity Eve 2010 while camping in a Yurt just before services at St Innocent Rogue River, Oregon. “BEHOLD a new and wondrous mystery. My ears resound to the Shepherd’s song, piping no soft melody, but chanting full forth a heavenly hymn. The Angels sing. The Archangels blend their voice in harmony. The Cherubim hymn their joyful praise. The Seraphim exalt His glory. All join to praise this holy feast, beholding the Godhead here on earth, and man in heaven. He Who is above, now for our redemption dwells here below; and he that was lowly is by divine mercy raised. Bethlehem this day resembles heaven; hearing from the stars the singing of angelic voices; and in place of the sun, enfolds within itself on every side, the Sun of justice. And ask not how: for where God wills, the order of nature yields. For He willed; He had the power; He descended; He redeemed; all things yielded in obedience to God. This day He Who is, is Born; and He Who is, becomes what He was not. For when He was God, He became man; yet not departing from the Godhead that is His. Nor yet by any loss of divinity became He man, nor through increase became He God from man; but being the Word He became flesh, His nature, because of impassability, remaining unchanged. Since this heavenly birth cannot be described, neither does His coming amongst us in these days permit of too curious scrutiny. Though I know that a Virgin this day gave birth, and I believe that God was begotten before all time, yet the manner of this generation I have learned to venerate in silence and I accept that this is not to be probed too curiously with wordy speech. For with God we look not for the order of nature, but rest our faith in the power of Him who works. Come, then, let us observe the Feast. Truly wondrous is the whole chronicle of the Nativity. For this day the ancient slavery is ended, the devil confounded, the demons take to flight, the power of death is broken, paradise is unlocked, the curse is taken away, sin is removed from us, error driven out, truth has been brought back, the speech of kindliness diffused, and spreads on every side, a heavenly way of life has been ¡in planted on the earth, angels communicate with men without fear, and men now hold speech with angels. Why is this? Because God is now on earth, and man in heaven; on every side all things commingle. He became Flesh. He did not become God. He was God. Wherefore He became flesh, so that He Whom heaven did not contain, a manger would this day receive. He was placed in a manger, so that He, by whom all things arc nourished, may receive an infant¢s food from His Virgin Mother. So, the Father of all ages, as an infant at the breast, nestles in the virginal arms, that the Magi may more easily see Him. Since this day the Magi too have come, and made a beginning of withstanding tyranny; and the heavens give glory, as the Lord is revealed by a star. This entry was posted in Liturgical Music, Miscellaneous and tagged 2014, Christmas Carols, Христос Pаждается! Славите! Christus Natus est! Gaudete! Χριστὸς Γεννᾶται! Δοξάσατε! Hristos se Naste! Ma ç riòi-L!, Nativity of Our Saviour Jesus Christ, Orthodox Christmas, St John Chrysostom Nativity/Christmas Sermon. Bookmark the permalink.